A few months ago I posted a blog suggesting that MOCA in Los Angeles should show more representational paintings. The blog touched a nerve and I heard from many, many artists and also from one museum: The European Museum of Modern Art -- MEAM. I had never heard of the MEAM, but I have been looking over its website and corresponding with artist friends to learn more about its ambitious programs and historic building. The MEAM is housed in the Gomis Palace, a renovated 18th century Neoclassical building in Barcelona, and is owned and operated by The Fundació de les Arts i els Artistes which was established in 2005 by the architect José Manuel Infiesta. The Foundation and the MEAM share a dual mission: both were established to exhibit and promote figurative art of the 20th and 21st Centuries. The Foundation maintains a website which presents contemporary representational works -- Figurativas en Red -- and also organizes an annual award in painting and sculpture. 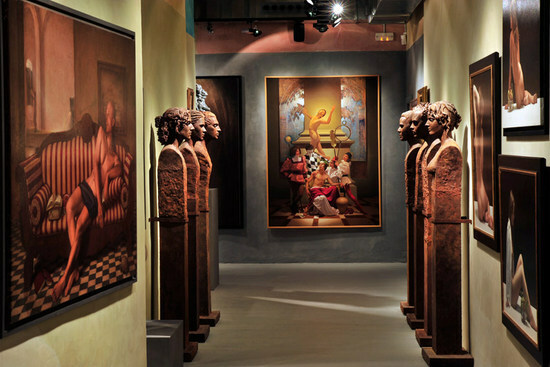 Interior view of the MEAM The Museum exhibits selections from the Foundation's three permanent collections: Contemporary Figurative Art, Modern Sculpture and Catalan Sculpture. A number of American-born artists are represented in the MEAM's collection including John Nava, and David Jon Kassan. I visited the MEAM last October for the opening of their 2013 Figurativas competition exhibition. Its an annual painting and sculpture competition sponsored by the Foundation for Art and Artists; the organization behind the MEAM. Being a painter myself, and having just relocated to Madrid I thought I would take advantage of the opportunity to visit the Museum as well as offer support to some colleagues who were selected for the exhibition. 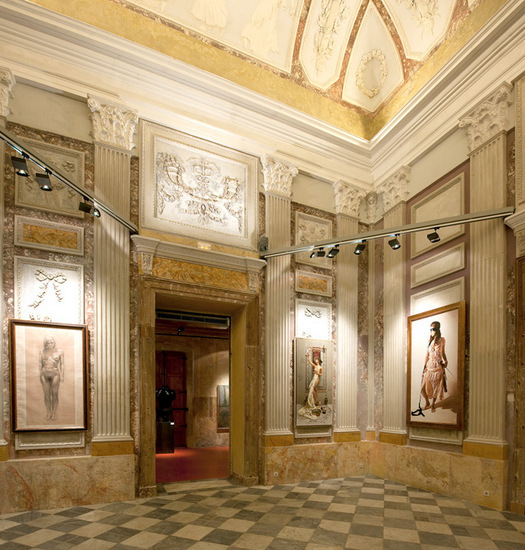 The Museum's collection is housed in a renovated 18th century palace in the heart of the labyrinthine city center. I wasn't quite prepared for the grandeur of the space. 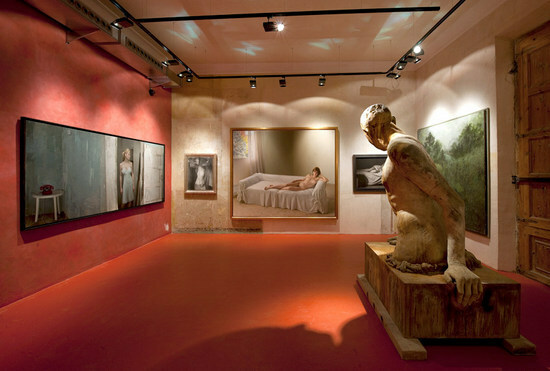 Its been beautifully preserved to evoke the charm of its former decadence, with its richly textured walls that serve as the perfect backdrop and compliment to its collection of contemporary figurative paintings and sculptures; the term figurative, in this case, refers not just to work representing the human figure, but more broadly referring to representational work. At the time of my visit, the first floor housed examples of its permanent collection while the second floor was filled with the work of the selected competition winners and finalists. The amount of work on display managed to dwarf the over 18,000 square foot space, which I think, in itself, is a testament to the rapidly growing community of contemporary figurative artists that the Foundation for Arts and Artists has been proactive in promoting and supporting. On the second day of the opening the museum hosted a discussion free to the public, and screened an hour-long documentary they made during the judging process of the competition. 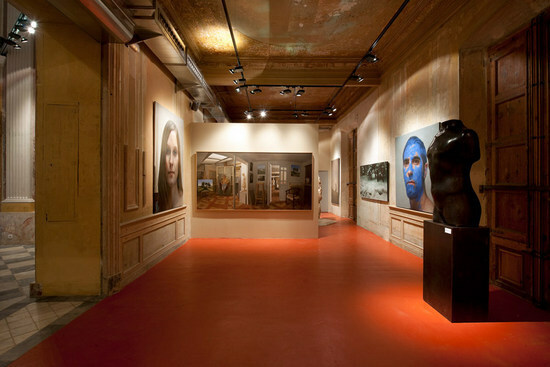 The judges consisted of Odd Nerdrum, Jacob Collins, Antonio Lopez Garcia, and Gottfried Helnwein among others. It was one of the highlights of the event, as we were able to witness candid moments of the jurors discussing their philosophies and often in disagreement. A big topic was the use of photography in representational painting, which is its own can of worms. Jacob Collins played a particularly interesting role in the film as he raised questions with the other jurors as to the standards for qualifying art and the importance of discussing artistic philosophies in order to come to a greater understanding as to the criteria for judging works. Ultimately, MEAM has proven to be a great resource for figurative artists, through its competitions, sponsorship, and engaging public events. I most look forward, though, to seeing how the artists will make use of their new champion. 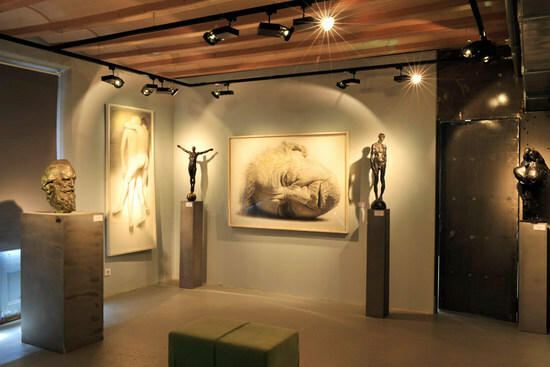 I think its interesting to have a space dedicated to contemporary figurative art after almost a century of self-described displaced and disregarded representational artists who couldn't get the time of day from an art world that rejected them as the remnants of an oppressively narrow, hierarchical, and irrelevant tradition. However much inevitable is the natural evolution of culture and its aesthetic philosophies, its unquestionable that we're now seeing a growing resurgence and acceptance of representational art. Harold Speed said, "There is, strictly speaking, no modern art any more than there is modern truth. There is just art and truth. There is good art and bad art, as there is truth and untruth." I agree with Harold Speed and like to think whether a work of art is representational or not is irrelevant and I would hope the quality of a work is judged on its own merits without bias towards its pictorial language. But the art world is still not a level playing field in that respect and until representational art can shake its stigma its pivotal that places like MEAM exist to support and promote contemporary representational art, treat it with equal significance and educate the public to its relevance. On the other hand, the new generation of representational artists also have the responsibility to investigate their own intellectual and technical criteria towards work that can stand on its own integrity. It remains to be seen how the artists will continue to handle this responsibility now that they have such a prominent venue. I was struck at this sort of Spanish "school" of representational painting. It seems to me that the most famous exponent of the attitude is Antonio Lopez Garcia. His success has clearly been hugely influential in Spain, but perhaps less obviously his essential humanism along with a liberal openness and lack of pretense is also reflected at the MEAM. By that I mean that one sees right away that the work displayed is, in one sense, all over the place. It isn't particularly programmatic. John Nava, "C. Standing," 2013, Oil on panel, 60 x 60 inches Collection of the European Museum of Modern Art (MEAM) There is a sense, instead, of greater comfort with modernity - a willingness to include a very wide variety of approaches. In this sense it is reflective of Antonio Lopez himself who paints with enormous sensitivity and scrutiny and yet can speak so admiringly of, say, Giacometti and also Wyeth. His interest in sincerity and true feeling allows him to have these wide ranging interests and not to be threatened by work that may violate some canon or other or that might seem to be too close to contemporary art world fashions. This contrasts with the seemingly more stringent polemics you encounter in many of the "ateliers" that have arisen in recent years. The MEAM celebrates figuration but is not so narrowly "one note." Regarding my impressions of the MEAM's collections: there are some impressive works there, but in general what I like about their collection of representational work is the breadth of what all could be called "figurative" work. I think that it speaks to the variety of imagery capable in what otherwise might be considered a narrow field. The space is beautiful. I think that it serves the work well, in that there is a certain aesthetic even in the colors of the walls and the lighting, that makes the museum experience feel familiar and comfortable. You can tell a lot of care went into making the building what it is. The location in the old city of Barcelona is also a great plus. I think what Infiesta is doing is admirable simply because of the resistance representational art faces in the contemporary art world. I think it's also important because there seems to be a great imbalance between those who are interested in making representational art these days, versus those who are willing to partake in it (i.e., view it, purchase it, show it, support it in any way). I can speak to that as an artist myself, as I've witnessed a growing number of people interested in learning and committing themselves to a classical training in recent years. So having more museums like the MEAM serves as a good outlet to the rest of the world for what this growing group of young artists is doing. Questions of relevance aside, it is hard to ignore the increase in interest towards a representational training among young art students. Going back to the impression of the MEAM's collections, I think it's important to note the breadth of subject matter and imagery that the collection boasts, in that whether these young artists go on to continue painting representational pictures or not, remaining within that so-called camp of representationalism is not limiting to the possibilities of their work.